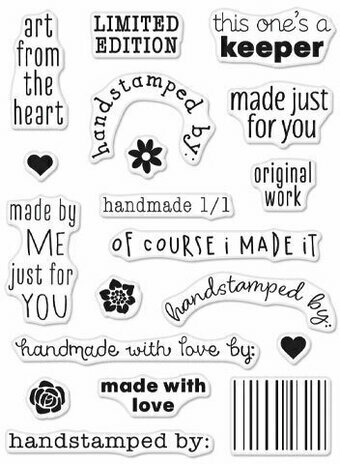 5 clear stamps on a 2.5x2 inch storage sheet featuring the phrases, "This belongs to:," "Original art by:," "Handmade by:," and "Created by:." 4 Clear Stamps on a 2x2.5 inch storage sheet. Features the phrases "Yep, I made this (don't throw it out)", "Styled By", "Made with love (The Good Kind)", and "100% handmade (would you like an autograph? )".